Asthma is the commonest chronic condition in children. It is characterised by reversible and paroxysmal constriction of the airways, with airway occlusion by inflammatory exudate, and late airway remodelling. In this article, we will discuss the epidemiology, pathophysiology, clinical features, investigation and management of asthma in children. Asthma is the most common chronic condition in children, with 1 in 11 children in the UK affected. In children, it is associated with low levels of mortality and morbidity. The pathophysiology of asthma is exceptionally complex, poorly understood, and beyond the scope of this article. Here we give the basic principles that underpin the disease process, but some detail is omitted. Asthma is a multi-factorial disease in which susceptible individuals have an exaggerated response to various stimuli. The disease process is driven by as vast array of mediators that lead to airway obstruction, and in more severe disease, airway remodelling. Classical allergic asthma is driven by Th2 type T-cells. Allergens are presented to these cells by dendritic cells, which in these individuals leads to a disproportionate immune response. The Th2 cells are activated by dendritic cells, and cytokines released from them result in the activation of the humoral immune system, with an increased proliferation of mast cells, eosinophils and dendritic cells as a result. In turn, cytokines released by these cell contribute to the underlying inflammatory process and bronchoconstriction. One particular example of this is leukotriene C4, which is directly toxic to epithelial cells. Other mediators further exacerbate the situation by favouring the production of an exudate, such as the histamine released from mast cells. Genetic factors: There is no single gene, but various loci have been associated with asthma. As a result, asthma/atopy in parents or siblings is a risk factor. Other: Viral bronchiolitis in early life, diagnosis of atopic dermatitis. Exacerbations of asthma are initiated by stimuli known as precipitating factors. Cold air and exercise: Drying of the airways due to cold air and exercise leads to cell shrinkage, which triggers an inflammatory response. NSAIDs shunt the arachadonic acid pathway towards the production of leukotrienes, which are toxic to the epithelium. The pattern of wheeze in an asthmatic is characteristic of the disease severity. Infrequent episodic wheezing: discrete episodes of wheeze lasting a few days with no interval symptoms (wheeze and cough free day and night). Frequent episodic wheeze: occur more frequently than infrequent (2-6 weekly). Persistent wheezing: wheeze and cough most days and may have disturbed nights. Wheezing is very common in preschool children; up to half of children will have had at least one significant episode of wheeze by their fifth birthday. Most commonly this is caused by a viral infection of the respiratory tract, often due to the human rhinovirus or respiratory syncytial virus (RSV). The wheezing episode in this instance is normally preceded by coryzal symptoms. Most preschoolers will outgrow their wheeze, however in up to 40% the wheeze persists into older childhood. Episodic viral wheeze – wheezing only in response to viral infection and no interval symptoms. Multiple trigger wheeze – wheeze in response to viral infection but also to other triggers such as exposure to aeroallergens and exercise. It is difficult to predict which preschoolers with a wheeze will later have a diagnosis of asthma. A careful history is essential to ensure that symptoms are consistent with a diagnosis of asthma. Whilst asthma is the most common chronic condition in children, it is easy to under/mis/overdiagnose. Any hospital attendances (A+E or admissions – including HDU/ITU admission – ventilated? Examination of throat to assess for tonsillar enlargement: infectious cause? In primary care, investigations are rarely performed; asthma is a clinical diagnosis and has no single diagnostic test. If the clinical history and examination are consistent with asthma and there is no doubt in the diagnosis, investigations may not be needed. However, it can be useful to measure lung function as a baseline. Usually normal in-between exacerbations, although there may be an obstructive pattern if poorly controlled (FEV1:FVC <70%). If an obstructive pattern exists, a reversal to normal after bronchodilators is highly suggestive of asthma. Peak expiratory flow rate (PEFR) is a crude measure of respiratory function. Bronchial provocation tests (histamine or metacholine) can be used in uncertain diagnoses, although they are not easy to interpret and require specialist input. Children with mild asthma (where diagnosis may be in doubt) will give negative results in 50% of cases. Skin prick testing or serum-specific IgE assays to allergens can be useful, but have limited role in diagnosis or management of asthma. Negative tests rules out an allergic sensitisation of airways to the allergen tested, although a positive result indicates only sensitivity and not necessary allergy. Exhaled nitric oxide (ENO) testing may be performed. NO is produced in bronchial epithelial cells and its production is increased in those with Th2-driven eosinophilic inflammation. Those with asthma have raised ENO and it can be used to measure control. It is also raised in allergic rhinitis (hay fever). Chest X-ray: in most children attending outpatient appointment a chest X-ray may be requested as it is useful to have a baseline CXR. HRCT (high-resolution CT) to exclude bronchiectasis. The overarching aim of managing asthma is to achieve good symptom control. In children, this includes full school attendance, no sleep disturbance, <2/week daytime symptoms, no limitation on daily activities, no exacerbations, using salbutamol <2/week, and maintaining normal lung function. Management based on guidelines published and regularly reviewed by British Thoracic Society (BTS), Scottish Intercollegiate Guideline Network (SIGN) and Global Initiative for Asthma (GINA). The management approach is ‘stepwise’ in that children move up to the next level of management if the current step is not controlling symptoms. The aim is to control all symptoms whilst being on the lowest treatment step possible. Step 1 – as required short-acting beta-2 agonist (salbutamol). Step 2 – regular preventer therapy with inhaled corticosteroids. If under the care of a respiratory paediatrician and control is not yet achieved despite high doses of inhaled corticosteroids with add-on therapy, some children may be prescribed a trial of biological agents. Omalizumab is a monoclonal antibody for IgE and reduces free IgE in the blood. This reduces IgE mediated inflammatory response. It should only be given to children who have persistent poor control as described above and evidence of allergic sensitisation to a periennial aeroallegen (house dust mite) and a raised serum total IgE. Aerosol inhaler devices should always be used with a spacer device. Always ask the question of compliance. Are the symptoms not controlled because the child is not taking the treatment? Long-acting beta-2 agonists (e.g. salmeterol) should not be prescribed as a monotherapy inhaler and should be prescribed in combination with a corticosteroid. Steroid equivalency: fluticasone is twice as potent as beclometasone so if a child is on Seretide 125 inhaler 2 puffs BD (125mcg fluticasone per dose) the equivalent daily beclometaone dose is 1000mcg (125×4 = 500, x2 (twice as potent as beclometasone)). Asthma management plan: all children diagnosed with asthma should have a written asthma management plan. An asthma attack has the potential to be life-threatening. Mild: SaO2 >92% in air, vocalising without difficulty, mild chest wall recession and moderate tachypnoea. Moderate: SaO2 <92%, breathless, moderate chest wall recession. Severe: SaO2 <92%, PEFR 33-50% best or predicted, cannot complete sentences in one breath or too breathless to talk/feed, heart rate >125 (over 5 years old) or >140 (2-5 years old), respiratory rate >30 (over 5 years) or >40 (2-5 years). Oxygen: SaO2 <94% should receive high flow oxygen to maintain saturations between 94-98%. Bronchodilators: Inhaled SABA (salbutamol) – via nebuliser if severe. Inhaler and spacer device is as effective as nebuliser in children with mild/moderate asthma attack. Corticosteroids: A short course (3 days) or steroids should be commenced. Oral prednisolone is first-line however if the child vomits or is too unwell to take oral medication intravenous hydrocortisone should be used. Intravenous salbautamol can be considered with specialist input if there is no response to inhaled bronchodilators. 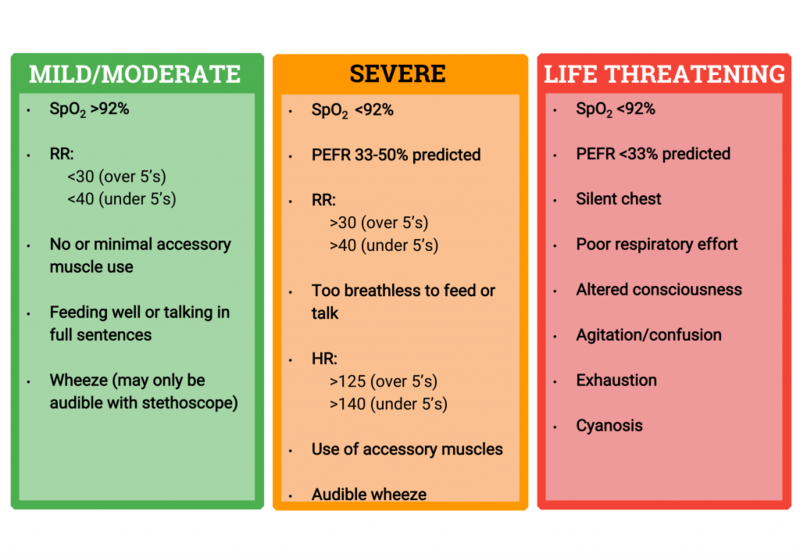 It is essential to monitor for salbutamol toxicity. Magnesium sulphate can be considered, as it has an effect as a bronchodilator. What is the prevalence of asthma in British children? Which cell type are primarily responsible for the disease process? Which of the following is a known environmental factor for asthma? Which of the following should not be prescribed to an asthmatic? Which of the following clinical features would decrease the likelihood of asthma being the correct diagnosis? Exhaled nitric oxide is also raised in which common condition? A poorly controlled asthmatic on step 2 of the pathway should have which drug added as the next step? Which of the following is a feature of life-threatening asthma? What is Step 2 of asthma management?